The function of hair in certain mammals serves the important role of conserving heat, and keeping out particles from invading the body through the ear and nose. The function hair has for the elephant does not seem to be as important as in other mammals. Hair appears sparsely over the body of the elephant. Interestingly, the calf is quite hairy over the head and back, gradually losing this hair as time progresses. The presence of hair around the eyes and in the ears appears to have a protective function. 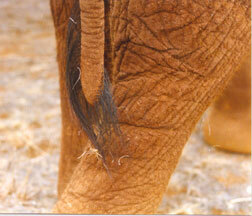 The larger hairs on the elephant are found on the continuously moving tail. Unbelievably, the hairs can achieve a length of up to 100 cm. The possible function of these can be used to dislodge flies. 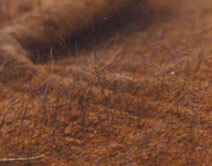 As shown on the right, a baby elephant has small fine hairs that tend to cover most of his/her body. These hairs will last in the same density long after the 1st year birthday. Incidentally, baby elephants rely many years upon his/her mother's care . Especially for females, the mother's presence (and close family) is an important role model and is instrumental in the in normal and healthy development of both a young and an adolescent elephant.